Welcome to our Smile Gallery. Please enjoy some of our amazing smile transformations! With modern technology and quality care, Morris Dental Clinic is able to create beautiful smiles for patients. Regardless of what dental issues you may have, we listen to your wants and needs to determine a solution. No challenge is too great—even if it’s been many years since you’ve been to a dentist. The following testimonials and photos (which speak for themselves) are great examples of just a few of the phenomenal transformations we have made. All these pictures are patients of Dr. Eric Rambow or Dr. Meghan Rambow. Before: Patient needs Upper Arch Rehabilitation. Presents with Upper Anterior teeth that are stained, misaligned and gumline recession is present. After: Smile restored with placement of 7 Upper All Porcelain Crowns (Caps). Gumline and incisal edges are now uniform. Patient now has longer, better shaped teeth to enhance the smile line and aid in chewing/biting function. white fillings on the front surfaces of the teeth. 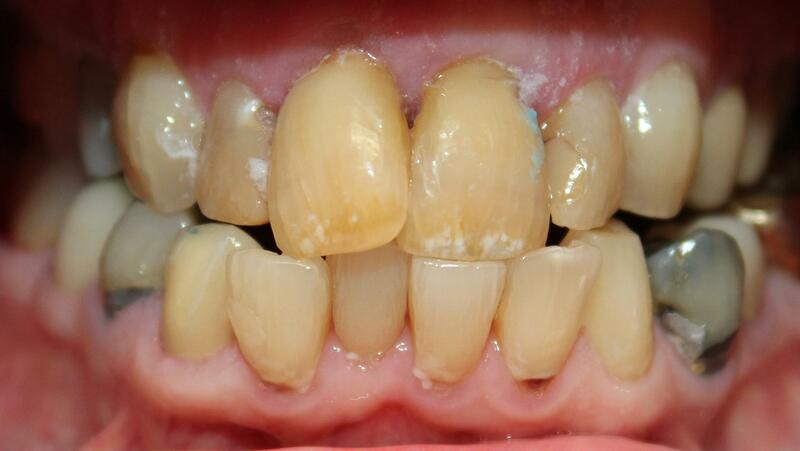 After: Six porcelain restorations restored the patient's smile.